Olpe notes that LC neurons decline in number with increasing age, with degeneration advancing slightly faster in men than women. The lessening number and activity of LC neurons that occurs with aging is known to play a significant role in the reduction of concentration, alertness, and information processing speed and ability that occurs with aging. 1. H. Olpe et al. 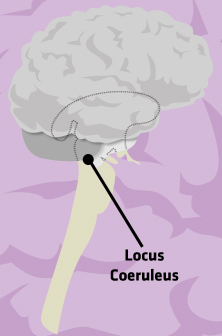 (1985) "Locus coeruleus as a target for psychogeriatric agents" Ann N.Y. Acad Sci 444, 399-405. 2. Gaál, L., Molnár, P. (1990). "Effect of vinpocetine on noradrenergic neurons in rat locus coeruleus" Eur. J. Pharmacol. Oct 23; 187(3), 537-9. 3. Schlicker, E et al. (1988). "Vinpocetine faciliates noradrenaline release in rat brain cortex slices". Drug develop. Res. 14, 285-291. 4. Shibuya, T., Sato, K. (1986). 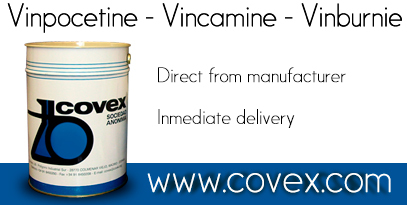 "Effects of Vinpocetine on Experimental Brain Ischemia, Histochemical Study of Brain Monoamines". Igaku no Ayumi 139 (3), 217-18.